In behalf of Te Waka o Taonui (the Taitokerau Iwi Chairs' Forum) Te Runanga-a-Iwi o Ngati Kahu coordinated the 2010 National ILG Hui held at Haruru Falls from the 4th to the 5th February 2010. A copy of the Te Hiku o Te Ika Agreement in Principle that was signed on Saturday 16th January 2010 between Ngati Kuri, Te Aupouri, Ngaitakoto, Te Rarawa, Ngati Kahu and the Crown is attached below. The January 2010 newsletter has been posted in to the private area. The inaugural Ngati Kahu iwi celebration of the talent and potential of Ngati Kahu Taitamariki and Tamariki, has now ended. It was a wonderful and joyous event. Photos from the festival have been posted to the images gallery and video footage from Te Karere and Te Kaea is available on the the links below. A quarterly Ngati Kahu newspaper titled Te Pu o Te Wheke has been started. 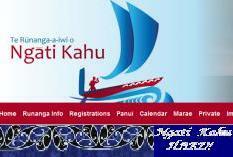 Its purpose is to provide the facts of land claim negotiations to all uri of Ngati Kahu so that they can give informed direction to their mandated Negotiators as and when the need arises. This newspaper is posted to all adult beneficiaries on the iwi register, and a copy of the December 2009 issue has been posted into the private area. The newsletter for November and December 2009 has been posted into the 'Private Area'.